Let nüvi 2555LMT lead the way with its big 5″ (12.7 cm) touchscreen display and powerful navigation features. It includes FREE lifetime traffic¹ and map² updates, advanced lane guidance and more. Garmin Guidance 2.0’s intuitive interface greets you with 2 simple choices: “Where To?” and “View Map.” Touch the screen to easily look up addresses and services and to be guided to your destination with voice-prompted, turn-by-turn directions that speak street names. It comes preloaded with maps for North America. It also comes preloaded with more than 8 million points of interest and offers the ability to add your own. With FREE lifetime traffic updates from 3D Traffic, our most extensive traffic avoidance system, nüvi 2555LMT can help you avoid delays. We check traffic conditions more than 2 billion times each month, so you can easily reroute around congestion and arrive on time. With FREE lifetime map updates, you always have the most up-to-date maps, points of interest and navigation information available at your fingertips. Map updates are available for download up with no subscription or update fees and no expiration dates. Now there’s no more guessing which lane you need to be in to make an upcoming turn. Available in select metropolitan areas, photoReal junction view makes unfamiliar intersections and exits easy to navigate. When you approach an exit or interchange, nüvi 2555LMT will enter split screen mode and show you a realistic depiction of junctions on your route, complete with road signs and arrows that indicate the proper lane for navigation. Point-to-point navigation is just the beginning. nüvi 2555LMT features a microSD™ card slot so you can download custom voices and vehicles for free from the Garmin Garage™. Dual-orientation functionality lets you hold the nüvi vertically or horizontally for added convenience driving or walking. The “Where Am I?” emergency locator provides your exact latitude and longitude coordinates, the nearest address and intersection, and the closest hospitals, police stations and more. And Enhanced Exit Services tells you what services you’re approaching on the highway. 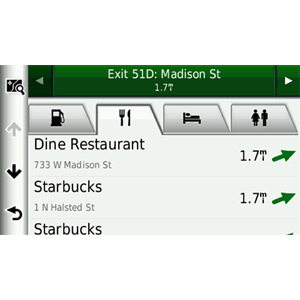 View routes on the 5″ (12.7 cm) widescreen touch display. Enjoy FREE lifetime map and traffic updates. Avoid traffic tie-ups with 3D traffic, subscription-free live traffic updates from the our extensive traffic avoidance system. Know which lane to be in thanks to advanced lane guidance with exclusive photoReal junction view. Use in portrait or landscape mode. See what’s coming with Enhanced Exit Services. 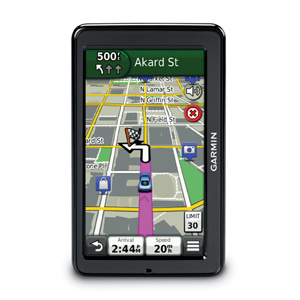 Get fast route calculations and address look ups with Garmin Guidance 2.0.